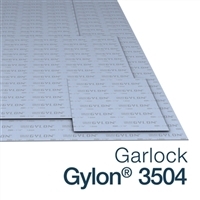 If you have issues with the cold flow problems that are common when using skived PTFE, Garlock Gylon® 3504 might be for you. Gylon® 3504 is made of virgin PTFE and filled with glass microspheres in a process that minimizes cold flow problems. This combination of PTFE and glass fillers makes Gylon® 3504 highly compressible and can be used in moderate concentrations of acids and some caustics, cryogenics, solvents, hydrocarbons, refrigerants, and solvents. Gylon® 3504 also conforms to FDA regulations.